Since the trial came to an end in July 2011 with a "NOT GUILTY" verdict, there has been a HUGE public outrage over weather or not someone will (OR SHOULD) make a movie about the case. Several television networks and production companies have vowed to NEVER pay Casey Anthony (OR HER FAMILY) for the rights to her story or even an interview for that matter. Claiming that they will not be responsible for Casey Anthony receiving money or profiting from her daughters death in any way. One network, however, has decided to proceed anyway and make a "made for TV" movie. In January 2013, Lifetime Movie Network will be airing "Prosecuting Casey Anthony". 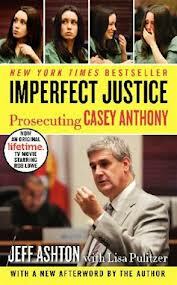 Based on the best-selling book "Imperfect Justice: Prosecuting Casey Anthony" by Jeff Ashton, the lead prosecutor in her murder trial. "Prosecuting Casey Anthony" reveals Ashton’s inside story of the true crime drama that captivated and then shocked the nation when Caylee Anthony’s mother, Casey Anthony, (Holly Deveaux) as acquitted of killing her daughter, despite what many thought to be overwhelming evidence of guilt. The movie is seen from Ashton’s (Rob Lowe) perspective and it takes viewers behind-the-scenes of both the investigation into Caylee’s tragic death and the ensuing trial, shedding new light on the many questions of what happened to the two year-old girl, how Ashton and his fellow prosecutors built their case and why a woman so shrouded in suspicion was proclaimed innocent. With in-depth information about the case and the accused, "Prosecuting Casey Anthony" examines what the prosecution got right, what they got wrong and why Ashton remains convinced of Casey Anthony’s guilt. Experts have proclaimed that the Casey Anthony murder case is the most publicized and documented case in american history! One year after Casey Anthony's acquittal, her lawyer Jose Baez has released a tell-all book,"Presumed Guilty." He shares his thoughts on the Anthony family, reveals how he believes Caylee died, and explains why his client was found not guilty. He speaks with Crimesider's Julia Dahl. "48 Hours" teams up with "Early Show" anchor Maggie Rodriguez for an exclusive interview with three members of Casey Anthony's defense team and an in-depth look at a case that has become a national obsession. "48 Hours" takes you inside one of the most dramatic murder trials in recent memory. Open-and-shut case? Maybe not. Troy Roberts goes inside the defense of Casey Anthony. Maggie Rodriguez spoke with Cindy and George Anthony, the grandparents of slain 2-year-old Caylee Anthony, about their daughter's possible death sentence if found guilty of murder. Casey Anthony - How Did We Get Here? Casey Anthony stepped into the national spotlight after the suspicious disappearance of her daughter, Caylee. As her story unfolded, many believed she was unquestionably guilty. The jury, however, felt differently. Anthony was acquitted of the murder charge, but she found herself loathed by the general public. NOT GUILTY verdict in the Casey Anthony trial. Casey Anthony Case, An epic legal drama unfolds in Florida: Did a young mother murder her toddler? Caylee Marie Anthony, the missing two-year-old girl, and her 22-year-old mother Casey have been the subjects of a many conversations. Tonight, the grandmother of missing toddler Caylee Anthony discusses why she decided to call police and report suspicious circumstances surrounding her daughter and granddaughter. Next, Ron Stucker, Chief of the Criminal Investigative Division at the Orange County Sheriff's Office, discusses the holes in Casey Anthony's story. Correspondents review the facts and hoopla surrounding the trial that will determine Casey Anthony’s guilt or innocence in the death of her daughter. Casey Anthony stands accused of murdering her 2-year-old daughter, Caylee. At the time of this posting, Casey Anthony has not been convicted of her daughter's murder. Her trial is scheduled to begin in May of 2011. This documentary combines audio of actual sheriffs interviews with news footage and commentary. In order to best convey the story, some scenes contain dramatizations, re-creations, and otherwise unrelated footage. Presumed Guilty exposes shocking, never-before revealed, exclusive information from the trial of the century and the verdict that shocked the nation. In this tell-all, Baez shares secrets the defense knew but has not disclosed to anyone until now and frankly reveals his experiences throughout the entire casediscovering the evidence, meeting Casey Anthony for the first time, being with George and Cindy Anthony day after day, leading defense strategy meetings, and spending weeks in the judge’s chambers. By renowned forensic psychiatrist Dr. Keith Ablow.